Look here for a wide variety of antique leather doctor bags, with a new selection appearing daily. 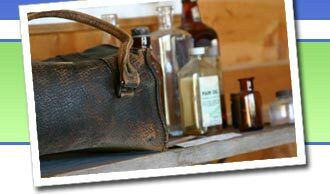 Rare pharmacy bags and leather doctor's bags from the 19th century and complete vintage sets including leather case and historic medical instruments. Vintage Large Black Leather Doctor's Bag 18"